Online shopping has become the new normal for the generation of digital natives. The B2C area in particular is growing, and it is increasingly causing retailers to rethink their brand strategies and how they sell online. 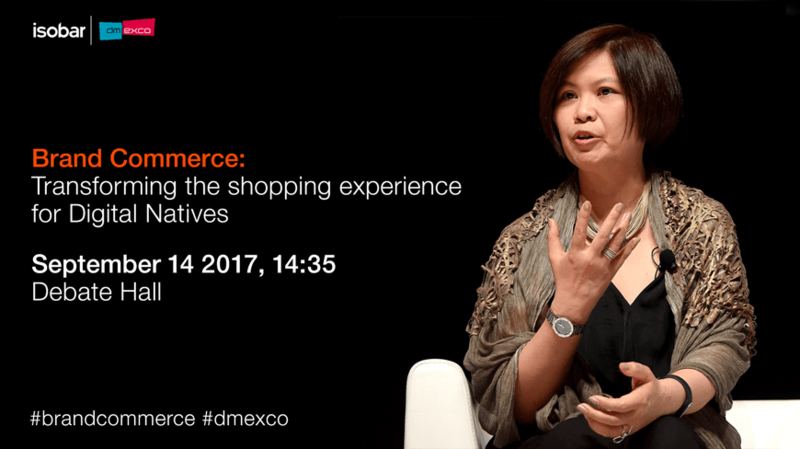 With that in mind, Jean Lin, Isobar’s Global CEO, and Kris Beyens, VP Operations EMEA for eBay, will share their thoughts on the future of shopping experiences for digital natives in their session, ‘Brand Commerce: Transforming the shopping experience for Digital Natives’ this week at dmexco, the leading digital marketing exposition and conference. If you are in Cologne for the conference, expect to see these two big topics: how innovation and creativity is being used to provide brands with a competitive edge and the importance of big data and AI, coupled with local insight to create relevance. Jean’s and Kris’ session will take place in the Debate Hall and will be moderated by Bernhard Glock, SVP, Medialink. The trio will explore the opportunities offered by the digital marketplace as well as the potential impact on branding, the tools that need to be adopted and how to build strategies around the digital customer experience. Jean will share Isobar’s perspective on the transformation of shopping using the creative use of digital, where brands can build loyalty with customers in a competitive marketplace and how the agency is utilising changing technologies to create new products and services for clients and customers. Isobar Singapore’s V-Showroom, a mixed reality sales tool for international automotive giant GM, is one example of the agency’s recent innovations to better connect brands with consumers. The proliferation of digital media has created a complex landscape for brands to connect and transact. In addition, the lines between advertising and commerce are increasingly blurring with the movement towards open interfaces and an increase in social platforms creating “walled gardens”. Hyper-relevance and simplicity of use has never been a bigger challenge for brands. Platforms are having to adapt to regional differences in digital consumer behaviours and building brand commerce strategies and technologies to best suit their audience. Similarly, Isobar’s recent launch of Isobar Commerce, a cross-market team of experts focussed on developing transactional platforms for brands, ensures access to global software and technologies whilst ensuring local insight. Delivering “always on” personalised experiences at scale remains a challenge for many brand marketers. In the session, Jean will also touch upon how technologies such as machine intelligence is having a massive impact on the way businesses use data and create brand experiences. So, if this is your business challenge, you are interested in the transformational work happening today or the future of brand commerce, drop into the Debate Hall on September 14th 2017, 2:35 p.m. – 3:05 p.m. Or keep up to date by following Isobar on twitter.